For Southerners like us, seeing the rocky California coast, sea lions sunbathing freely on the beach, whales breaching, and kelp forests seemed like an exotic adventure that didn’t require a passport! 1. Stay on the water at the Monterey Bay Inn. This was such a neat experience that made it worth the waterfront price tag more than we expected it would. Why? There is something so deeply relaxing about hearing the rush of waves on the rocks and the gentle “pat-pat-pat” sounds of seabirds’ wings hitting the water as they flew right over the water’s surface. Drinking a hot cup of tea on the balcony while watching a fishing boat head out for the day’s catch was the perfect way to start the day! Being able to come back to the room with a view after the day’s activities kept us enjoying the scenery even more. This one’s a bit ironic, because I get seasick. But no way was I going to turn down getting the chance to see whales up close. So in a bittersweet mixture of queasiness and exhilaration, we were graced with the spouting of whale exhalations, tails, backs and even an adrenaline-pumping double breach (two whales jumping out of the water simultaneously)! 3. Kayak in the kelp forest and see sea otters. Who wouldn’t want to see an endearingly cute sea otter frolicking in the kelp and wrapping itself in it to take a nap? We took a short walk to a kayak rental place, and pushed off from the beach to mosey around the bay. One of the coolest experiences was holding onto a frond of kelp as an “insta-anchor” (as recommended by the kayak rental staff) and feeling its strong holdfast steady me and the kayak. We even got to see a seal pop up curiously and a group of sea otters grooming their fur, playing in the kelp, and even finding a bite to eat! 4. Visit the Monterey Bay Aquarium. Ok, so I’m a little biased about this one being a Marine Biology teacher. It was like being a kid in a candy store, seeing all of their magnificent living exhibits, from the kelp forest to the ever-changing tidal tank! My eyes couldn’t stop darting from each unique creature and well-informed exhibit to the next. I wanted to take it ALL back with me somehow to share with my students. 5. Feast on local sustainable seafood. Monterey Bay was one of the main reasons we adventured to California and we are so glad we did. We loved it so much that we will certainly be returning, hopefully soon! Can’t wait to do ALL of these things next month in Monterey! Thanks for the inspiration! 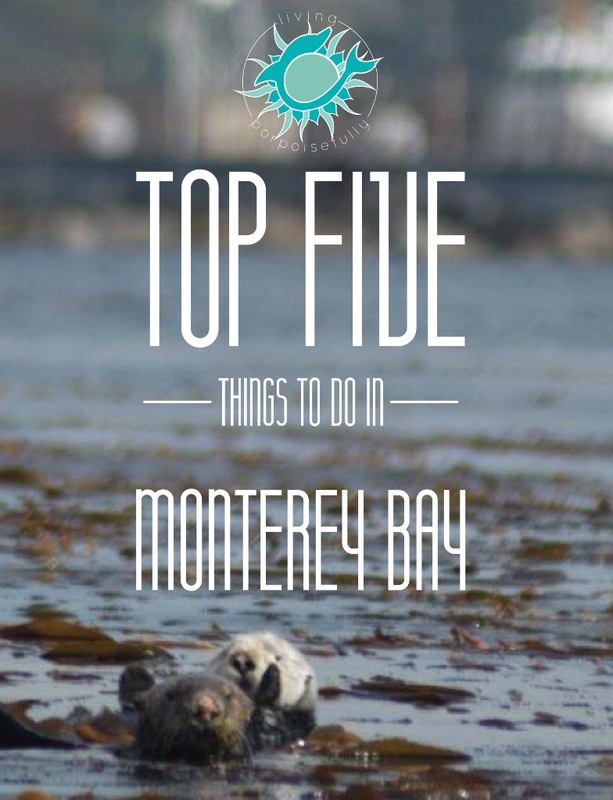 So glad you’re getting the chance to visit Monterey and that our post inspired you with must-do’s! Thank you for your note and have a FABULOUS time!